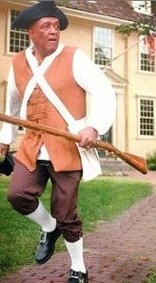 APRIL 19, 1775 Thaddeus Bowman has just ridden rapidly to the door of Buckman Tavern, his shouts bringing Captain Parker outside in response. A few words and hand gestures and Captain Parker summons young William Diamond. As Diamond begins beating his drum, numerous members of the local Training Band rush from the Tavern and begin forming — with others recently arrived — on the green behind the meetinghouse. Thirty, then forty, growing to fifty, the men line up in field formation, awaiting instructions. Captain Parker paces to and fro before the men. He explains, "we are not to molest the troops, we're to let them pass, but we must stand our ground if challenged." Our number has grown to more than seventy. Wondering what will transpire, we nervously look at one another, then down the road toward Menotomy, the direction pointed to by Bowman a few moments before. Suddenly, glints of light can be seen shimmering in the distance. A few at first, then maybe a dozen. There seems no end to the number of points of light. As if being awakened from a trance, we're startled to realize that each is the reflection of the sun's rays on the barrel of a musket. A musket carried by a trained, professional soldier in the service of His Majesty, King George. We've trained and drilled for this moment. However, something is different. I sense a nervousness in our ranks. Voices swirl but do not linger long enough to be contemplated. Voices, noting the great number of soldiers; voices, pointing to their approach on the left and right; voices, expressing concern for our position; voices of alarm at the fixing of bayonets. A mounted officer can be seen coming around the far side of the meetinghouse, shouting. The troops on the near side of the meetinghouse cannot see him. They seem to be approaching more rapidly. Captain Parker, recognizing the threat, orders us to disperse. As we turn and head away, a shot rings out. Glancing back toward the Regulars, all is orange-white flashes and clouds of smoke. A few militia return fire, but most are not in proper position. 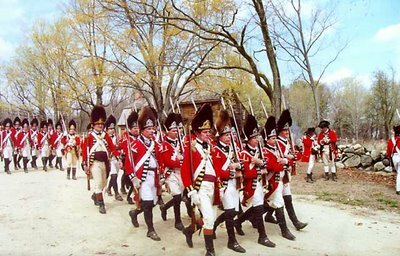 The sight of onrushing red uniforms, with fire-belching muskets, hurries our retreat. Some hop over stone walls, or dart between trees, hoping to avoid the torrent of musket balls. Trained, professional soldiers in the service of His Majesty, King George. With hearts pounding and explosions ringing in our ears, we slow our retreat upon hearing the sound of a drum beating "To Arms," and the cessation of musket fire. As we cautiously peer back toward the green, we can see the mounted Officers have managed to control the Regulars and are re-forming their columns. The smoke is beginning to clear and the scene is frightful. There are bodies lying on the ground. Can they be dead? They don't move. Maybe they're feigning death, until the Regulars move on. Loud HUZZAHs from the ranks of the Regulars break the spell. Spectators run to the fallen. The injuries appear to be serious. That looks like Isaac Muzzy. And there. Can that be Jonathan Harrington? What has happened? How can this have happened? Captain Parker appears to be calling for us to re-form. The Regulars have been out of sight for many minutes now, but we are still slow to re-assemble. Some of the casualties have been carried from the field. The Captain vows we shall not let these brave men die for naught. The plan is to meet the Regulars again, as they must inevitably return to Boston. We will be ready.